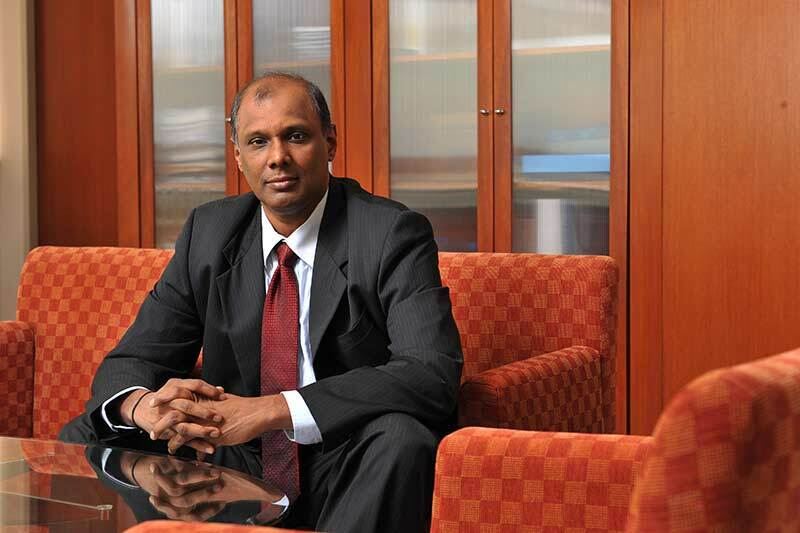 OpenGov spoke to Thillai Raj T Ramanathan, Chief Technology Officer of MIMOS Berhad. This is the first part of the interview (click here for Part 2), reporting on the implementation of Internet of Things (IoT) strategy in Malaysia. Can you tell us about the broad areas of focus in the short and medium term? I will start with a short description of the role of MIMOS. We are an agency under the Ministry of Science, Technology and Innovation (MOSTI). Our charter is to do R&D. We are the national R&D agency for ICT for the country. We focus on many areas of research, security technologies, Internet of Things (IoT), big data analytics, nanotechnology. Our work encompasses a whole gamut of areas but basically these technologies converge together to produce solutions for IoT and Big data analytics. These are the two key things we are looking at. Take security as an example. In both IoT and big data, we look at security and privacy issues, how to make sure that the privacy of the individual is maintained, that their personal data is not leaked. To take another example, we are looking at edge computing. Though networks are improving today,we find that there a lot of latencies in networks because of the advent of IoT. To get data from point A to point B, it has to pass through multiple hops and each has associated latency. When we are handling mission-critical things, using IoT or big data, we need the latency or the time taken to be very short, at the scale of milliseconds. Instead of computing on the central cloud, we place devices on the edge and do the computation there. Effectively, the devices form an ad hoc cloud on the edge. They compute and send the results back. So, you just need small bandwidth to carry the results back. Data transfer time from the device to the cloud goes down significantly. We are also looking at nanotechnology, at how to miniaturise products. This includes microelectronics, microelectromechanical systems (MEMS). We are looking at how to use graphene to build flexible electronics and make wearable devices. Do you face any issues because of the variability in network availability and quality across a large country? Broadband penetration is increasing in the country. But the number of users has increased tremendously. On top of that, most of us carry more than one device. We may carry one or more cellphones, a notebook, a tablet. Even in urban areas, with reasonable networks, the networks are slowly getting congested by the proliferation of IoT devices. We think that the speed and bandwidth of networks cannot cope with the number of devices being introduced by the consumers. For the urban areas, we have moved more and more things to the edge. You still need your backend backhauls or your network back to data centres. But with edge computing, the data load is much smaller. When you look at rural areas, telecom companiesare reluctant to invest there. Because the Average Revenue Per User (ARPU) is very small. The population is sparse and you don’t get many users to a base station. So, in those communities, we give them a whole mesh Wi-Fi network, which are linked back to the cloud. You get your IoT device talking to your phone using Bluetooth or NFC (Near Field Communication). Then the data goes back over theWi-Fi, and passes through the backhaul back to the cloud. That is the cost-effective solution we see for rural areas. What kind of capital expenditure (capex) is involved? It is still a capex but the capex is much smaller. We are also trying to make it self-sustained. The first thing is security. If you have a Wi-Fi in a village, then we add cameras to it. The villagers are using the cameras to do their own surveillance. They can monitor if the kids going to school are safe, if the public areas are safe, whether there are any intruders anywhere. The second part is services. They are able to sell their agricultural produce and trade over the network in general. This creates a whole ecosystem and generates income, which can be used for maintenance. It’s not just about installing it the first time, it is about maintaining the infrastructure. Once the villagers see the benefit of a portal like AgroBazaar, where they can market produce from their farms or livestock, then usage will go up. Lot of them are in distant villages where they do not have direct access to connectivity. They also get to see the market prices. They can accordingly adjust their production to maintain demand-supply balance and prevent drastic price drops. This gives them economic control. They will keep the infrastructure going, because they see social and economic value in it. How do you ensure that the end-users adopt the technology? Most of the applications run on mobile phones. The ubiquitous big touchscreens have improved the adoption of technology massively from what it was 10-15 years ago. The ease of use is the key. Navigation is much simpler. Then the inherent ‘value’ I mentioned previously is a major driver. Is the data collected from such systems being used for decision-making? That data is very valuable. As they begin to use the system, we can see patterns of usage. We don’t look into the data. The data is private. But we look at the patterns. Like when and from where are they logging into the system, is it from their house, from their community areas.We are able to draw inferences from that. We analyse the data to decide where to position the Wi-Fi signals. Because the village is too big, Wi-Fi cannot cover it. But we have hotspots placed strategically. Looking at this data, we can tell if they are using it mostly in the community hall and then ensure good coverage there. We also get to see how often are they using the data to sell their produce. If it is not effective, then we try to find the reasons. It could be because our system is not user-friendly or it frequently hangs. This helps us do a continuous cycle of improvement. Improving the services to the community is key. In terms of analytics, we also do video analytics. Like checking how many intruders have gone into the area. We can give the feedback to the community, so that they can take appropriate safeguards, like placing a security guard at the right locations. Are you working on developing common IoT standards? The bottom layer in IoT is the devices. On top of it, you have the network providing connectivity, which could 3G, 4G, Bluetooth, Wi-Fi etc. Then there is a layer called the middleware or the platform layer. Then you have the applications on top. There are many IoT standards today, maybe more than a dozen. We found that the biggest problem for industry was working on the platform layer or middleware, which translates all the devices and different protocols into some protocol which you can then use for designing applications. To help the adoption of IoT by Small and Medium Scale Industries (SMEs) in Malaysia, we have designed a platform, which we released two weeks ago during MyIoT Week. It’s called Mi-MIST (MIMOS Internet Service of Things). It is designed to make connectivity easier. We didn’t just design a middleware but we released our own products based on MIST. Can you tell us about some applications of the platform,Mi-MIST? Let me tell you about our Durian story. There is one variety of durian called the Musang King. It is one of the best durians in the world and it comes from a specific place. The durians are frozen, put into boxes and shipped to China. They are distributed around China. It is a multi-million-dollar business. Some of the surrounding countries were also selling durians, which they claimed was Musang King. The Malaysian Durian ExportersAssociation sought our help in stopping or reducing this counterfeiting. In IoT the first thing is the sensor. The sensor for us was a QR code on the box. The box also had a serial number printed on it. The consumers in China are highly concerned over fake goods. Now, you can use your handphone to scan the QR code. It will take you to a site that will tell you where the durian came from, how it was packaged, what certifications does it have, such as Halal certifications or ones from health agencies and where it was shipped. Following this, the Exports of durian to China actually grew by 30%. The buyers can check the authenticity of the durian and for the sellers it is an excellent marketing tool. They can track in which part of China the scan was being done and how many scans were happening and thereby get geographical sales data. In this case, the IoT comprised the QR code, scans done by the phone, sending data back through the network through the middleware,Mi-MIST. We used this in-house designed solution to demonstrate how Mi-MIST could be used. Another example, is a project we did with the police. Individuals charged with crimes are detained in police lock-ups for a certain period of time before they go to a court. The lockup cell is shared by multiple people, up to 7-8. There were incidences of fights, people getting beaten up, even deaths. There are not enough wardens to monitor all the cells. The police and the Human Rights Commission wanted to avoid this. So, we put a camera in the lockup. Here the camera is the sensor. The camera detects the behaviour and then video analytics is used. The machine looks at the video images and detects aggressive behaviour. It sends an alert automatically to the police. Now they can respond quickly, whenever there is an alarm. It saves lives by getting prompt medical attention in case someone is injured. The network was Wi-Fi and the middleware was Mi-MIST again.